World War I was an 18-month war that is perhaps the one least remembered in America. We entered World War I on April 7, 1917, and we lost 116,000 soldiers the final year of the war. Sadly, pieces of history are starting to fade away and be forgotten. Linda Hixon, a Worcester State University adjunct professor of history, and her class have dedicated their time and effort to restoring some of that history. They visited the Worcester Memorial Auditorium to get the names of all 355 Worcester soldiers who were sent to World War I for a book of biographies of those soldiers. Hixon also reached out to readers of the Telegram & Gazette newspaper to help her locate information on the Worcester World War I veterans. About 30-40 people volunteered, along with students from her class and Bancroft Upper School’s 10th grade honors class. The book they created is titled “They Ventured Far.” Here, she answers questions about the book and the process used to write it. What inspired you to create a WWI biographical book? Because it was the centenary of the United States’ involvement in World War I, I thought a class on Worcester and the Great War would be a great way to learn about a largely misunderstood conflict. Luckily, Tona Hangen (chair of the History and Political Science Department), was more than willing for me to teach the class, and students were excited to sign up. The book was a natural off-shoot of the class. How long did this book take to finish? We started the class in January 2017, and the book was published in November 2017. 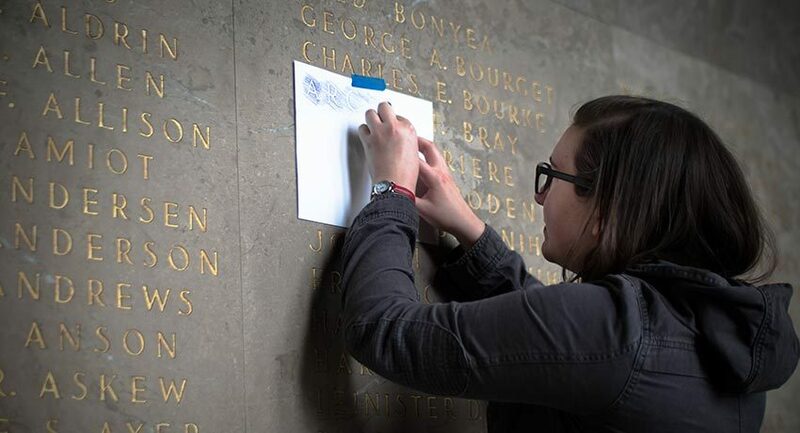 There were 353 men and two women listed as Worcester’s WWI honored dead on the wall at Memorial Auditorium, so there was a lot involved in creating and finishing the book. There are also chapters on the building of the Auditorium and the murals featured above the list of names, and on Camp Devens, where many of the men trained. Where are the books being distributed? Currently, we are distributing books only to those involved in the class, volunteers on the project, or those who helped us with our research. We are hoping eventually to sell the book in local stores and maybe even on Amazon! What were your thoughts and feelings each time information about a WWI soldier was discovered? Personally, I love writing about these fallen soldiers—which I’m sure sounds odd. But being able to rediscover the lives of people who died 100 years ago, many of whom are long forgotten, is such a rush. There was one soldier, Roy Bates, whose father was about 100 when his 27-year- old son died, a fact I found in a tiny Boston Globe article that was more about the father than about the son. The father, Butler, had served in the Civil War. Roy had been married before the war, and his only child had died as a young girl. It was a little heartbreaking. [Roy’s] mother, Ida, was much younger than Butler, and she buried her only grandchild and her only son in Hope Cemetery in Worcester. What do you hope people will learn from reading this book? I hope people learn that war heroes should never be forgotten. Memorial Auditorium has stood empty and unused for decades, yet it’s a memorial to the dead from one of the bloodiest wars in the world. The biggest battle losses ever suffered by the United States happened in World War I (over 26,000 killed-in-actions at the Meuse-Argonne Offensive), yet now this war is barely remembered. Worcester is better than that—it’s time to remember these men and women. This project began about two years after Hixon and another group of history students worked on a similar project about Worcester fallen Civil War soldiers. 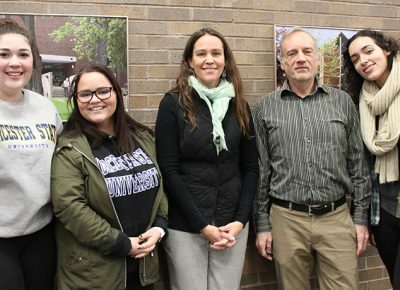 Under a new partnership proposal, a struggling community in Brazil might soon get the help it needs through the work of Worcester State University students and faculty. Several faculty members are working on a memorandum of understanding with Catalytic Communities of Rio de Janeiro, a non-governmental organization that supports the city’s much-discussed favelas, the thousands of informal . . .